Jumbo Empanadas: Imitation is a Form of Flattery, Right? I love looking through the food blogs, finding inspiration for new ideas and different takes on well known dishes. I like Slashfood because at a quick glance I get a variety of foodie topics. 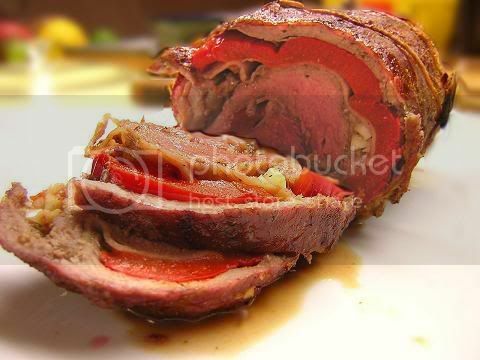 Recently there was a picture of a rolled, stuffed steak that caught my eye. At the time I didn’t actually follow the link to the original post, but made a mental note that it was something I should look into further. Then a few days ago Dad said he wanted to do something different with steak for dinner and left it up to me to figure out what that would be. I had a picture of rolled steak flash before me. I remembered that the one I saw on Slashfood had roasted peppers in it, but that was all I remembered. I figured I could just stuff my steak with whatever I wanted/whatever I had. What I happened to have was some extra proscuitto, (I thought this was especially clever of me to add) garlic, a Spanish onion, a red pepper and hot pepper jelly. As an added bonus the red pepper was actually already roasting in the oven. I was originally going to use it in my weekly squash soup but decided it would be better in the steak. So I pounded out the steak until it was nice and thin and then layered it with proscuitto, roasted red pepper, minced garlic, chopped onion, a few spoonfuls of hot pepper jelly (mmm sweet with heat, in a good way) and a dash of Chinese 5 spice. Once the steak was rolled up I rubbed the whole thing with Magic Dust (from the July issue of Bon Appetit, I make up a big batch and use it on everything). Then I passed it off to Dad to finish on the BBQ. It was really good and I had immediate requests to make it again. I thought at this point that I should check out the original post of the rolled steak that I had seen on Slashfood to get some ideas for next time. The original post was by Rachael of Fresh Approach Cooking and as I clicked onto her site I realized that what I had thought was so clever of me (adding the proscuitto) was actually not my idea at all. 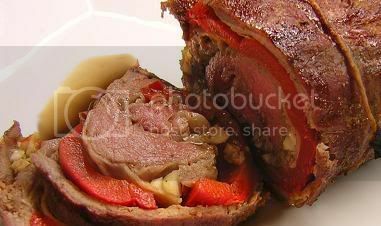 Rachael’s dish is entitled Proscuitto and Roasted Pepper Stuffed Flank Steak. Clearly I stole the whole thing from her. Her post is great too, it’s about how much more fun foods are when they’re rolled. I whole-heartedly agree. I suggest you go have a look at her recipe, it’s more detailed than mine, (there are actually quite a few differences once you get past the main three ingredients) and her picture is tasty. She also does hers in the oven as opposed to on the BBQ. Thanks for the creation Rachael, my family is thrilled with the new dish. I’d like to finish off with a public service announcement: Back up your computer! I nearly had a fit this morning when my computer shut itself off and refused to come back on. All is well now and I’m in the process of copying everything to a second hard drive. Posted by Brilynn at 11:26 a.m.
You are so sweet! I'm really glad you liked it. I will have to try it on the grill...sounds fab. Looks good none the less! It looks great. Anything rolled and stuffed seems to taste better. Steak and proscuitto. That's definitely a great meal! Maybe great mind thinks alike?! And I think BBQ is splendid! That's a mouth-watering photograph. Sounds like a delicious meal. Hey, this looks familiar, and delicious!